Another day, another recommendation. This one came from the princess of the pie, Miss Sally Stabler. In a previous post I likened her palate to that of a 75 year old chap, however this does have its uses. If anyone is going to sniff out a decent pie, chips and gravy, she's your girl. A few weeks ago I received an excited text from young Stabler advising of pastry cased perfection just down the road in Aspull. I hoped for something similar to the plate pies of the Hen and Chicks (RIP), but I actually found something better. Yes. The Gerrard Arms is a proper pub. There's a long bar, massive tellies playing the footy and a big gambler in the corner. Alongside the fizzy yellow crowd-pleasers are a few decent real ales, and the folk who frequent the place seem a good bunch. At the back is a tidy outdoor seating area which appeared to be full of cyclists, walkers and the odd dog. The service was great for a pub, and the chap who served us seemed genuinely enthused about the food he brought out. He did look a little nervous when I told him about the pie recommendation, obviously assuming that wee Stabler was some sort of pie aficionado. 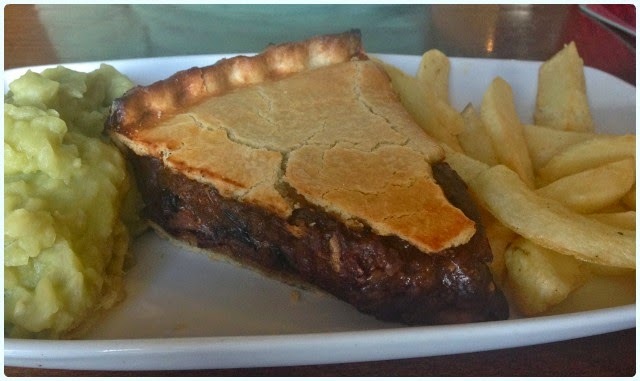 Steak pie, mushy peas, chips and gravy: Dad's pie of choice, and hand picked by my petite pie eating pal. Wonderfully deep with some of the best pastry I've tasted in ages. This encased generous chunks of beef and mushroom in a thick gravy, with a peppery finish. My dad's only complaint? Pepper. He's not a fan and felt there was a little too much. I'm more impressed that Sally ate something that had touched mushrooms, 'I was enjoying it too much, so I pulled them out!' - quote. This is a major development for a girl who won't even entertain most normal food. 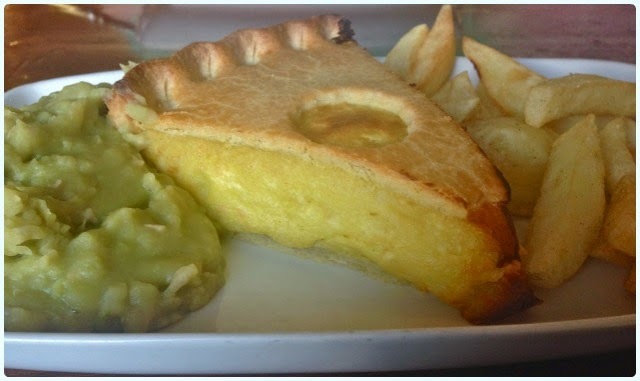 Cheese pie, mushy peas and chips: Look at the depth on that mother! A behemoth amongst pies. One of the best cheese pies I have ever tasted. That will be the end of it. Sirloin steak with sauteed mushrooms, grilled tomato and chips: This was from the daily specials board. 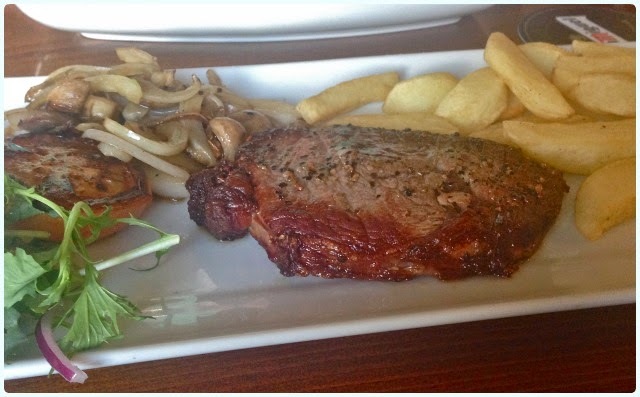 It wasn't the biggest of steaks, but at £13.95 you really can't grumble. It was good quality beef and came cooked as requested, which in itself has proved a bit of a battle elsewhere recently. Full of pie, we retreated without sampling the desserts, but I'd love to go back at some point to try a pudding or two. However, I'm not going to lie to you, I think I would have that cheese pie every day of my life if I could - but I fear I would be dead within a month. The Gerrard Arms is a proper boozer that does decent food. It's not some sleek gastropub with a duckegg interior and tables reclaimed from the local cotton mill, but the food is honest and homemade, and the service was fast and friendly. I can see why Sally loves it here.